2011 has been a year of yurts, w/two opportunities to try out this simple design of sticks and mud — a more permanent adaptation of the traditional, portable, Mongolian design. One was for a friend and neighbor. 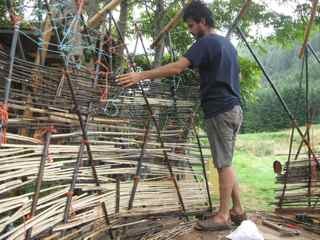 The other was a workshop atÂ Aprovecho Institute, as part of their sustainable shelter building series. Lots of people helped! 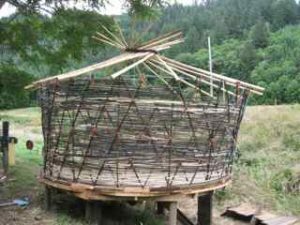 Both were made with locally harvested bamboo and fir poles (arranged reciprocally to make a self-supporting, conical roof w/a central skylight, which I’m still trying to figure out how to cover cheaply…) Here’s a little picture book about the whole process. Neat!!!! Note: the link to the picture book isn’t a clickable link. 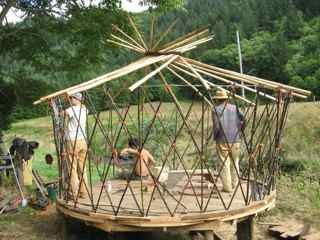 Nice adaptation of yurt construction, Kiko. Regarding a cheap skylight: how about the huge translucent plastic salad bowls they use in cafeterias? Not sure if it will withstand UV, but worth a try. Though you’ve already done the rather resourceful plastic water bottle, why not merely do a cupola? Double- or triple-glazed 360 degrees would admit massive amounts of light while keeping the rain out & BTU in. You could open top level windows to vent excess heat – if you build screens into it. Only the framing would block “view”. Paper-crete that puppy to insulate it, then see how little winter heat is needed. I’ve yet to read anything that says what you use to prevent some of these creations from becoming huge anthills. Any thoughts there? Living in north Florida means far too much sand (ants) and buy clay to do cob. Will cat litter or Floor-Dry work for small projects? Great idea. instant guestroom for in-laws and out-laws. We have many feet of snow per year how strong is this construction? About the reciprocal roof, however, keep in mind that roof failure can happen w/nothing more than the loss of a single attachment between two rafters. Since each rafter supports all the others, the loss of one connection can easily cause catastrophe. That’s why I’m revising this part of the design — but I won’t have more documentation until next year. 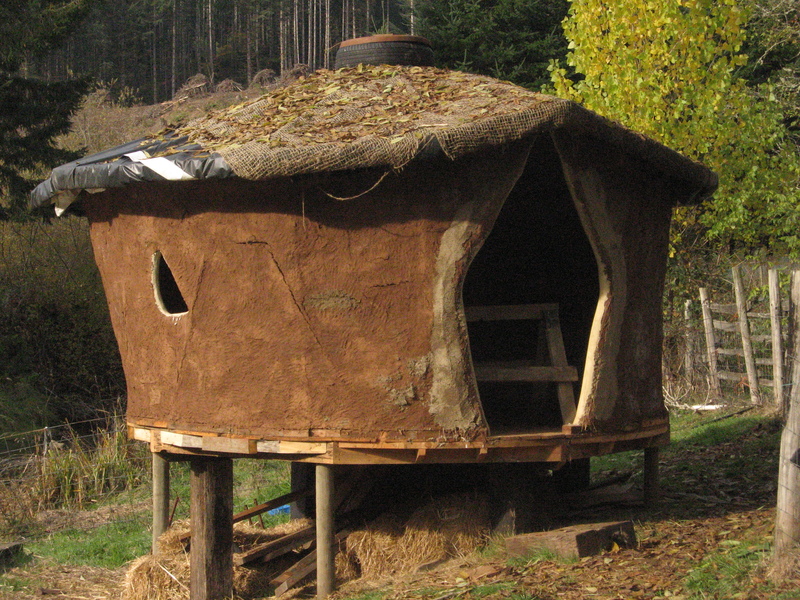 If you’re interested, I’d look at traditional and other yurts and look at the design of their compression rings at the top center of the roof — the woodwork is complex for a reason. But I am hoping to come up with some simpler, easier techniques. Stay tuned! We live in an area with an average of at least 10m of snowfall per year (sometimes 15m) & would be very interested in any knowledge you have acquired – through experience, research, or intuition – as to the load-bearing capacity of a reciprocal roof. We live in an area with an average of at least 10m of snowfall per year (sometimes 15m) & would be very interested in any knowledge you have acquired – through experience, research, or intuition – as to the load-bearing capacity of a reciprocal roof. Many thanks for all of your efforts in natural building and the sharing of your knowledge. I think I would use a large pole or post, about the size of a telephone pole (without the chemical) planted about 6′ in the ground, then attach the roof sticks around it. I believe that would make a more stable and stronger roof. Ya, this would work, but then you have a pole in the middle of a (small) building. The traditional yurt design that uses a central compression ring to arrange and contain the rafters allows for a wonderful combination of strength, practicality, and beauty. The traditional yurt design that uses a central compression ring to arrange and contain the rafters also allows for a central fire or wood stove for cooking and heating. Not unlike a traditional Native American tee-pee. Or the traditional round house of the Cherokee. Thinking about doing a small yurt with my four year old! Needless to say, she needs NO excuse to get her hands in some mud!! Neither do I!